News of fraud by SIM has become common now. Every day we hear that someone took away the seam and took away millions of rupees from the account. But do you know how this frog finally happens? How people cheat millions of rupees by knowing the SIM number. What is seam swapping - this fraud is called seam swapping, in which the thug seam card is replaced by new seams. Seam swaping has a direct implication that your seams will be switched duplicate seams. If the cheat succeeds in doing so, then the boundary of yours will come to him. 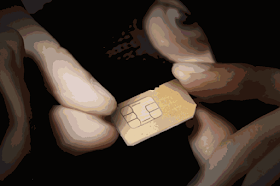 The SIM card has user data, and it can be used for authentication. The thug can easily be used to cheat. The phone wants to seam the serial number - the thug for the first time by the seam calls you a new number, and tells the employees of a telecom company themselves. Then there is an excuse for resolving call drops and Internet problems. Apart from this, talking about updating your seams. When you are stuck in his cheeks, he asks you a unique number of 20 displaceings written back to you. That is how money comes out - If a criminal has called a user for seam swapping, it can happen, he has your bank details , Such as bank account number, debit-credit number information already But despite all this, the money can not be withdrawn from the account because OTP is needed. If swim swaps, the OTP number will also be registered on the registered mobile number and the offender can easily withdraw money from the bank. Apart from this, it is also used for shopping. In addition to this, the cheat sometimes also wants a support number with a mobile number, because nowadays it is linked to most of the services support from the bank. To avoid this fraud, usually the seam swapping process takes some time. That means your phone's signal will disappear after a few hours after your confirmation. In such a situation, thugs want to distrauve your attention to get away from the phone so that you can switch off the phone or send a cilantate. So do not switch your phone to any of these times. If you have such a call, keep an eye on your bank account and contact the bank immediately if you have a suspicious transaction. Sometimes these rogue people harass you so much that you turn off the phone in anger, and that's just waiting for them. So if you do not get a message on the number of transactions and you do not know. So do not close your mobile at any cost.